This important collection presents a radical reconception of the place of knowledge in contemporary policymaking in Europe, based not on assumptions about evidence, expertise or experience but on the different forms that knowledge takes. Knowledge is embodied in people, inscribed in documents and instruments, and enacted in specific circumstances. 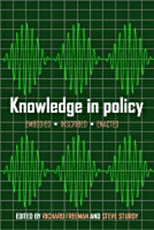 Empirical case studies of health and education policy in different national and international contexts demonstrate the essential interdependence of different forms and phases of knowledge. They illustrate the ways in which knowledge is mobilised and resisted, and draw attention to key problems in the processing and transformation of knowledge in policy work. This novel theoretical framework offers real benefits for policymakers, academics in public policy, public administration, management studies, sociology, education, public health and social work, and those with a practical interest in education and health and related fields of public policy.